Sophia overcame her depression in a StrongMinds therapy group. Today, she sells food items in the Bwaise Slums of Kampala to support her family, and is happy. 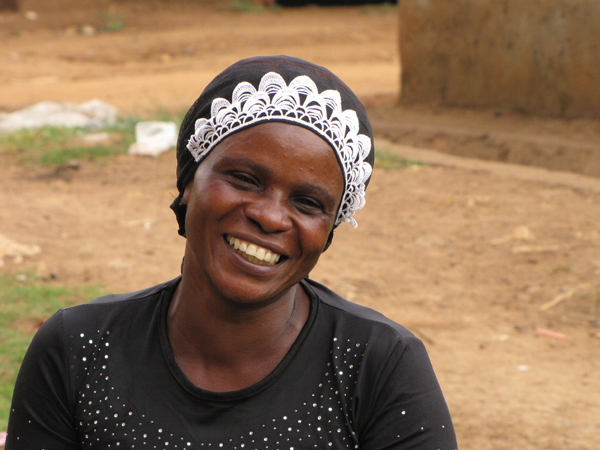 MEET SOPHIA, a 45-year-old single mother of six children in Kampala, Uganda. Years of prostitution triggered a deep and severe depression for Sophia. Her life in the Bwaise Slums was incredibly difficult, and her depression made caring for her family all that more challenging. A StrongMinds Mental Health Facilitator reached out to her, diagnosed her with depression, and invited her to join a StrongMinds Talk Therapy Group. With support from the women in her group, Sophia began to learn coping strategies to manage her depression and to reduce her symptoms. Six months after completing her 12-weeks of StrongMinds Talk Therapy Group, Sophia continued to be free of her depression symptoms and was no longer engaging in prostitution. Sophia still meets with her fellow group members, and they help one another to prevent future episodes of depression by sharing life strategies, experiences, and fellowship. Sophia has become an active member of her community and recently joined the civic council that works to improve the lives of people living in the slum community. “StrongMinds has made such a difference in my life,” Sophia proudly tells us, with a smile. Now Sophia is able to make a difference in the lives of other women suffering from depression within her community. She has been trained in an adapted StrongMinds curriculum and now leads her own Peer Therapy Groups on a volunteer basis. Her smile continues to shine and give hope to others.